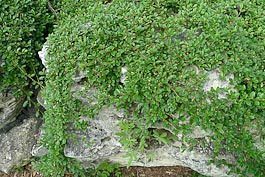 Perennial ground covers are low-growing, spreading perennials or woody plants that you can grow in spots in the yard where it’s hard to grow anything else. 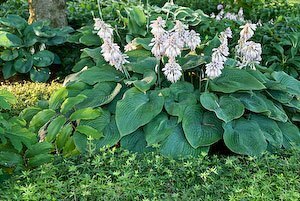 While rarely given a starring role, these plants can be a vital part of your garden’s supporting cast, and once established, they leave little elbow room for weeds. One thing to remember is that they’re not as forgiving as lawn grass is for walking on, however, you can use stepping stones or a wood chip mulch to make a path through them. You can use ground covers to replace lawn on steep slopes where mowing can be dangerous or difficult. Shade-tolerant ground cover plants grow under trees and shrubs or in the shadow of buildings, where lawn often struggles. When thinking of perennial ground covers, the big three for shade – Japanese spurge (Pachysandra terminalis), periwinkle (Vinca minor) and ivy (Hedera helix) – come to mind. They are popular because they stay evergreen and can take shade from mature trees, but can be invasive in some parts of the country, so use them with caution. Like trees and shrubs, ground cover plantings are fairly permanent. It’s tough to expel a mass of well-established ivy – I know because I’ve done it – so pick your spots carefully. You don’t need to stick with perennials only. Some shrubs – low-growing spreading evergreens such as junipers or creeping cotoneaster – also do the job as ground covers for sun. Mix and match: Perennial ground cover plantings don’t need to be all of one type. Try planting a low-growing ground cover out of which taller perennials can grow (this is called ‘underplanting’). 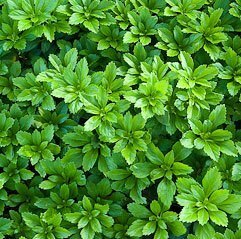 For example, in the picture above, I underplanted a large hosta with a carpet sweet woodruff. Do your soil homework: The most important job is to get rid of any perennial grasses and weeds and their underground roots and stems. See soil preparation and shade garden soil for how-to tips. By the way, adding a thick layer of new soil over existing tree roots is NOT a good idea. You can damage trees by layering too much soil over their roots: two inches of added compost or topsoil is acceptable, six inches isn’t. When to plant: Spring has its advantages, as plants have a longer growing season to get established before it gets cold. Early fall is also a good time to plant, as long as the plants have six to eight weeks to get roots established before the ground freezes hard. Planting distance: Space plants according to their size and their rate of growth and habit. For example, pachysandra and periwinkle are usually spaced six to 10 inches apart in parallel rows. Shrubs, such as cotoneaster and juniper should be spaced three to four feet or more apart. The mature width of your plants determines spacing. For example, space plants that grow 24 inches wide 24 inches apart. Be patient: It may take two or three years for your newly planted ground covers to fill in the areas you’ve planted. In the meantime, you do need to weed between plants. Mulch on soil between the plants will reduce weeding, conserve moisture and improve appearance until the plants fill in. See more information about mulching. Weeding: Hand weeding is essential until the plants grow together. But even established plantings need to be weeded, as it’s very difficult to remove perennial weeds or turf grasses once they become established in a ground cover planting. Fertilizing: If your ground cover plants face heavy competition from tree roots, apply a complete granular fertilizer such as 12-12-12 at the rate of 1½ to 2 pounds per 100 square feet every spring. Alternatively, mulch with compost or leaf mould. Water after fertilizing.